Lee is now older than Jesus. When I told him that the other day he got a little down in the mouth. I told him not to worry, I’m right behind him…in another four years! 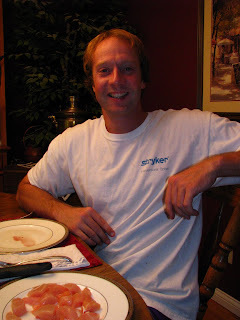 heh, heh, heh Really, happy 34th birthday to my husband who I am madly in love with. I am so grateful to be Lee’s wife. He brings out the best in me, he makes me laugh every day, he’s a phenomenal father and a superb husband. When Lee and I first met, he was only 23 – I was only 19. That seems like ages ago and not very long ago all at once. I remember celebrating Lee’s 25th birthday with him. This was at the beginning of our courtship and we were making tentative steps toward being an official “couple.” I went with him that afternoon to HEB to pick up a few items for the K-Life house and I boldly and proudly declared that he was now half a decade old. Mmmmhmmmm. I was ridin’ high on that 4.0 wasn’t I? Horrible, horrible blonde moment. In my defense I am a complete and total literary nerd, which means that my skill level in math ceased somewhere around the 3rd grade. Still, as soon as I said that I knew it didn’t sound right. Lee still brings that up to this day. Last night, our awesome friends kept the kids for us so Lee and I could have a night out. Because we are (ahem) broke these days, I decided to surprise Lee with a special dinner at home. 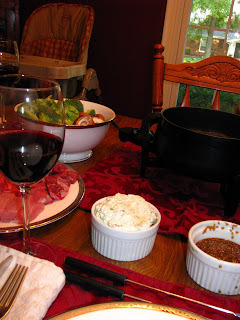 We love The Melting Pot, so I downloaded a couple of their recipes, cut up a bunch of meat and veggies and brought out our seldom used fondue pot. It was awesome! 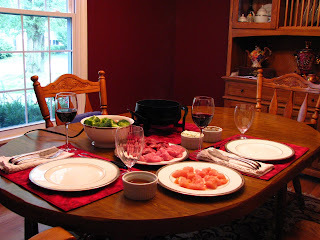 It was so relaxing to sit at home, in the quiet, and have a leisurely dinner. We had the Coq Au Vin with steak, pork, chicken, broccoli and mushrooms. We had three different dipping sauces, Sesame Soy, Thai Peanut and Melting Pot’s Green Goddess dip. We had a lovely bottle of red wine and for dessert had chocolate fondure with all the goodies. It was so fun. Happy birthday Lee, Hey who better to be compared to than Jesus! I hope you and Kelli had a kickin (to use one of her terms) night. You didn’t eat the chicken raw, did you??? Happy Birthday Aaron, I mean Lee!! Cory and I have only known you and Kelli for a little over 4years now and you really are one of the funniest guys I know. Hope you had a GREAT birthday we can all celebrate about a month late when we get together on 10/25! Happy Birthday Lee!! It sounds like you guys had a wonderful date!! What a great idea!